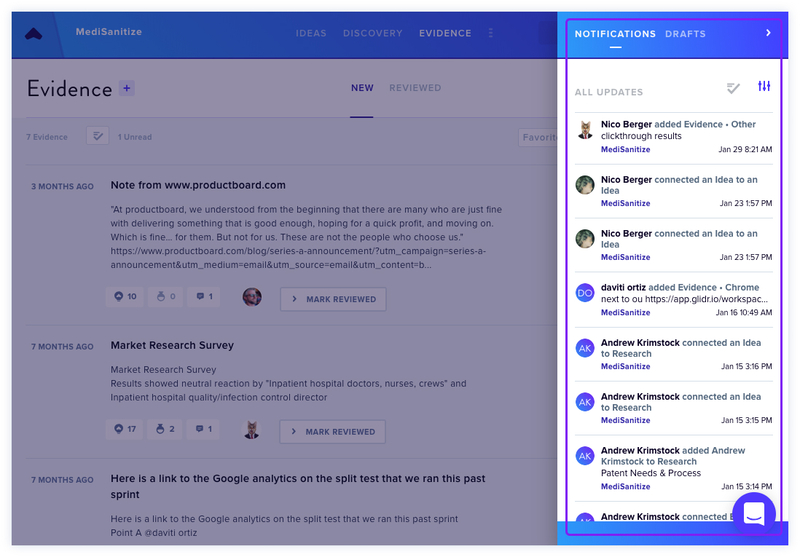 GLIDR puts feedback, discovery and validation at the center of your academic program. 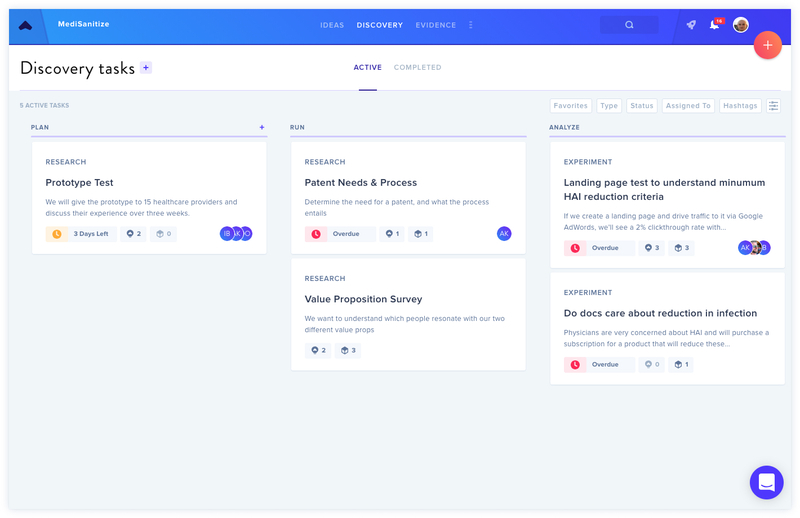 GLIDR gives your students tools to test their Ideas through Research & Experiments, and connect validated Evidence, while giving you a real-time overview of their progress. Clicking the three line menu in the top left will allow you to manage your organization. Select the menu dropdown with your organization name, then Team Management to add or manage team members. You can either add team members individually, or all at once. You can view your current members and change their overall permission level. Click the permission level beside users' names to update it. Members are those in projects adding data and doing the work. They have no administrative access and can only participate in projects they are added to. This is the suggested permission level for Students. Admins have limited administrative access, can create projects and collections, and invite users. They can view all projects. Owners have the highest level of access, and can create projects and collections, invite and disable users, and edit the Resource Menu and Project Questionnaire fields. They can view all projects. This is the suggested permission level for Instructors and TAs. Disable users to remove their access, but preserve any work they've contributed. As an Enterprise user, you can create multiple Projects, allowing you to keep track of your whole portfolio in one place. Each team within your cohort should have their own Project. To get started with your first Project, open the menu bar on the left hand side of the screen. Locate the + button to add a new project. After filling out the Project name and Project details, you can invite more Team members if you wish, but you can also add them at any point in the future. 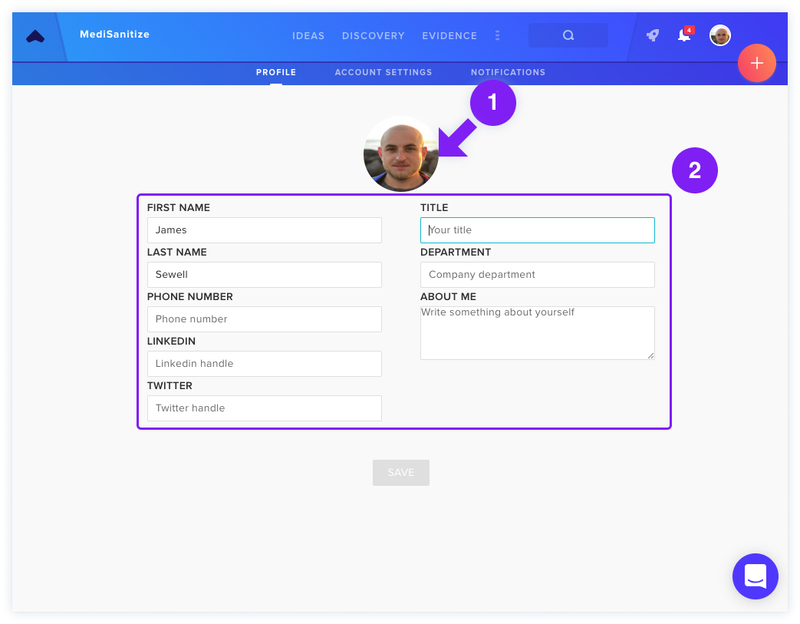 Project Admins have full access to the Project, including adding or removing team members. This is the suggested permission level for Instructors and TAs. Collaborators are the ones who are doing most of the work on the Canvas itself; adding and removing cards, connecting Evidence etc. This is the suggested permission level for Students. Commenters can view all sections of the Project, and can comment on Ideas and Evidence etc., but can't add or remove cards. This is the suggested permission level for Mentors. Observers can view the Project, but are unable to make any changes or additions. NOTE: Owners and Admins can view all projects regardless of the visibility setting. Private: members can only view the project if added to it. Otherwise, it will be entirely invisible to them. Public: members not added to this project can view the project dashboard. 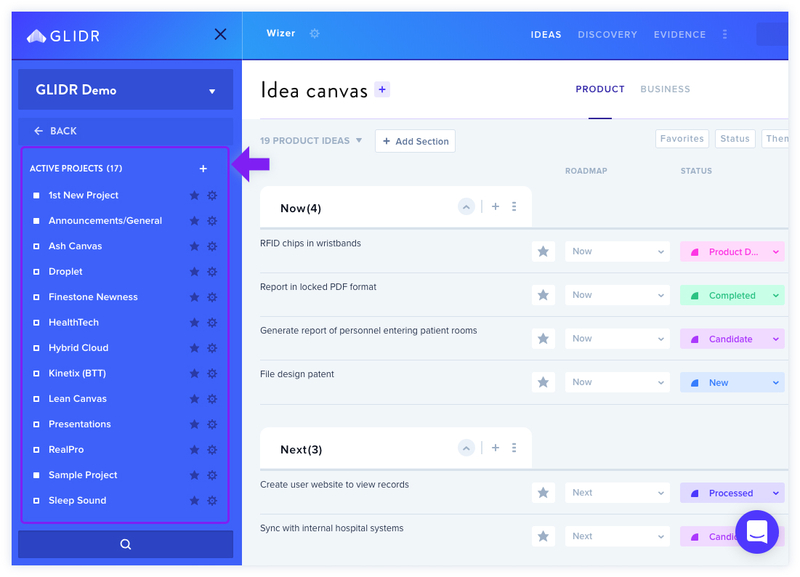 GLIDR offers a Business Canvas and Product Canvas, allowing your teams to distinguish the ideas that are directly related to the market vs. related to the product. It's likely that most of the work will be done in the Business Canvas, but as your class progresses and teams develop their business model, some teams may wish to start adding Ideas in the Product Canvas. 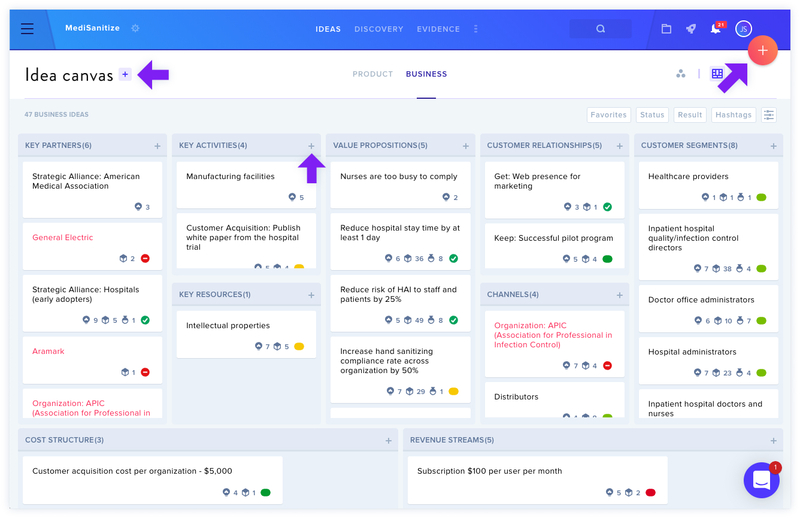 If you'd like to learn more about using the Product Canvas to organize Product Ideas, click here. It's easy to start filling out the canvas. Navigate to any of the + buttons to begin adding Ideas. Keep it brief! There's a 100 character limit, but team members can click on the Idea to add more detail and expand on their thoughts. Your teams will be gathering evidence that will ultimately help them validate or invalidate their Ideas. This can be in the form of customer discovery interviews, A/B tests, smoke tests or one of various other tests. 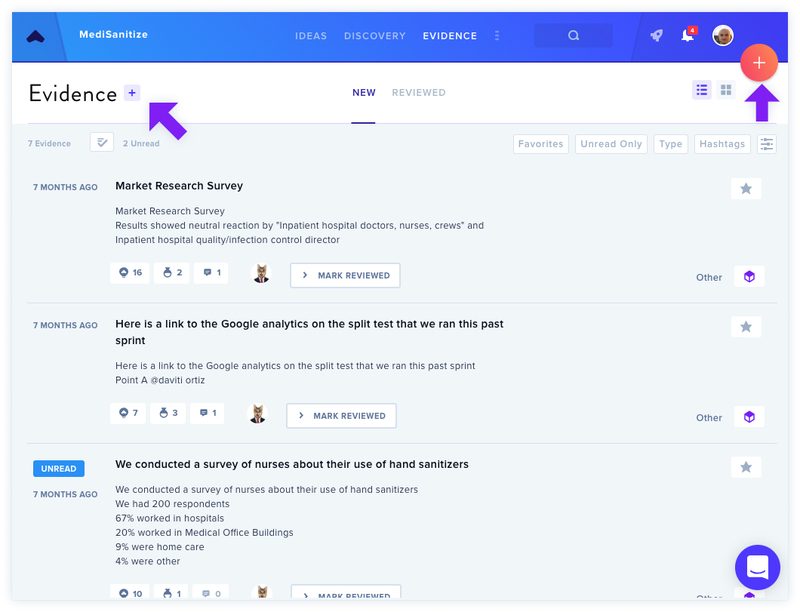 By navigating to the Evidence section of their team, they can begin adding Evidence using the + button. The Evidence tab is also where you will see other Ideas that have already been added by team members. 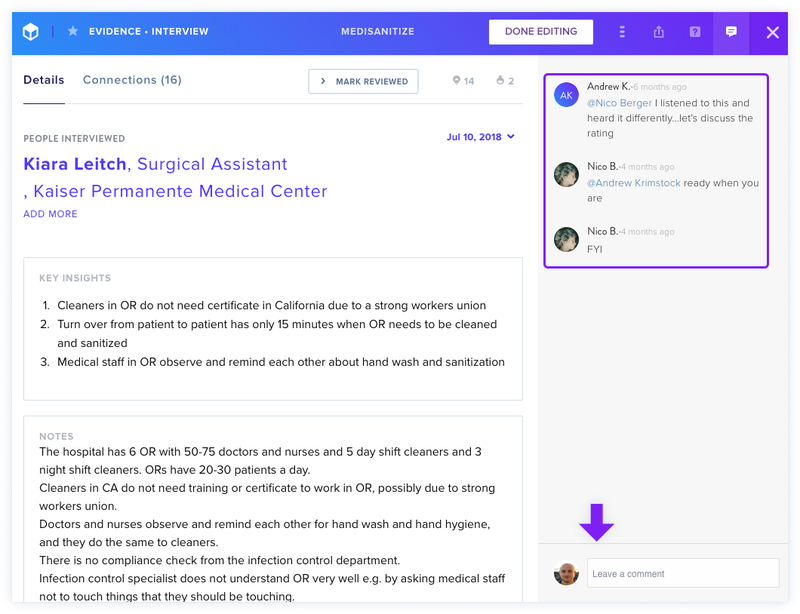 In the same way as adding an Idea, the Summary section provides a space to enter a customer discovery interview transcript, results from a landing page test, and any other relevant information relevant to the evidence. Once Evidence has been added, it can be connected to Ideas, or vice-versa. Clicking on the Connections tab will show you any existing connections between the Evidence, and you can also add or edit connections to Ideas. You can design Research (researching without a specific outcome in mind to generate new Ideas) or an Experiment (testing a specific Idea to get a precise yes or no result). Learn more about and how to add Experiments and Research. The Portfolio Dashboard displays the number of Ideas, Evidence and Discovery tasks added, and helps Instructors, Mentors and TAs track the class Portfolio. You can follow the progress of all teams, and ensure that everyone's on track. You can find out more about the different sections of your Portfolio Dashboard here. Collections are a way to organize Projects by class, department, group, etc. and see their metrics grouped in one place. In the left-side menu, click on the + button next to Collections to create a new Collection. Once you have created a Collection, you can find it in the left-hand menu. Clicking it will take you to the Dashboard for that Collection. Click the Notifications Icon in the top right navigation bar to open the Notifications drawer. You can view Drafts here as well. NOTE: Be sure to update your Notification Preferences via your Profile Icon to ensure you're notified when there's an update in your project! 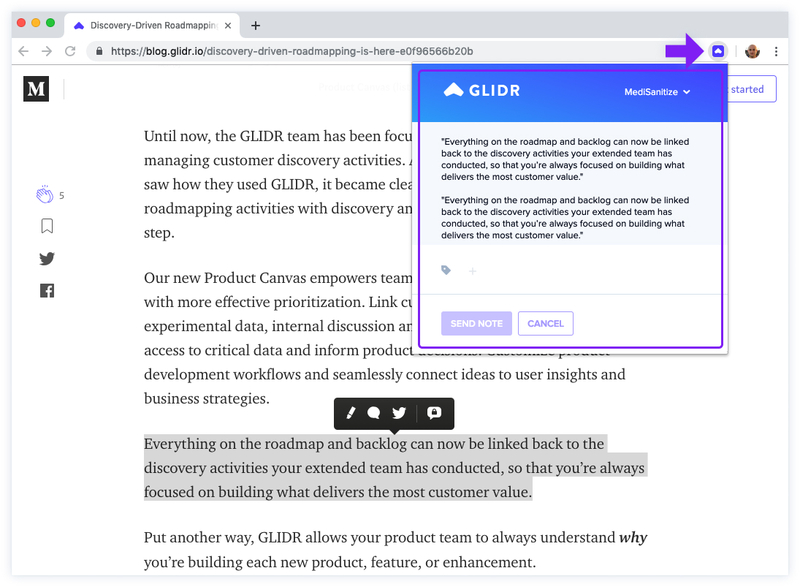 Skip the manual entry of relevant resources and data with our Chrome extension, Capture by GLIDR! You can easily grab text from anywhere across the web and the extension will create new Evidence for you. Open it up to connect it your Ideas, Research, and Experiments.